Nick has been an avid shooter his entire life. In 2004 he enlisted in the U.S. Marine Corps and was an 0351 Assaultman with 3rd battalion 8th Marines from September 2015 to April of 2018. 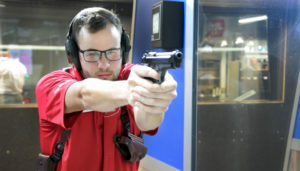 Nick is 3 times expert rifle qualification in the USMC and has instructed handgun marksmanship as well as holster draw techniques.